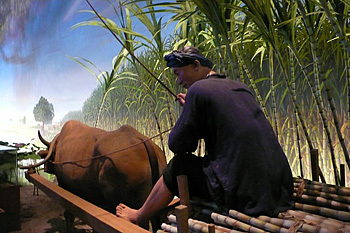 After 12 years in preparation, the National Museum of Taiwan History (NMTH) opened in Tainan on October 29, 2011. While Tainan has never been short on tourist sites, historic relics, and focused mini-museums, a grand museum was definitely what the city needed. The NMTH has filled that void and given tourists a place to gain a broad overview of the island’s history and culture all in one spectacular location. Unfortunately for tourists who are on that typical weekend trip to the city, the museum may be a little too far out of the way to fit into their visit. But for those staying longer, and for those of us who live in the city, it is well worth it to get out to see this museum. Located in Annan District to the north of the city center, the museum site sits on the remains of the Taijiang Inland Sea, which was an important trade and immigration site during the early years of settlement. In addition to its historic significance, its remote location also allows for the museum to sit on 20 hectares of parkland. The Museum Park includes two lakes, a bamboo house, an ecological education center, and a hill that is claimed to be the highest point in ever-flat Annan District. The park is an attractive and well-designed space worth checking out for its own sake. Architecture buffs will also have reason to visit the museum regardless of the exhibitions inside. It is quite a building, as you can see from this video on YouTube. One of the aims of the architects was to blend post-modern architecture with traditional island dwellings such as stilt houses and red-brick courtyards. Another aim was to harmoniously integrate the building with the land, water and sky. This is best represented by the Cloud Wall, which serves as the signage for the museum. The Cloud Wall is a huge wall of 1350 solar panels which sits along the edge of a pond and reflects the sky above. It also helps power the exhibition hall, signifying the museum’s commitment to ecology. Overlooking the permanent display from the upper floor. 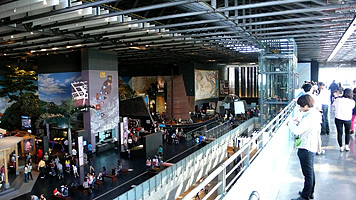 Inside the museum, the exhibition space is spread out on three levels. The first floor has mixed functions including the lobby, gift shop, some children’s areas, and some introductory displays that include a recreated train interior. The second floor mezzanine contains the permanent exhibition and the upper floor is used for temporary exhibitions. The primary focus is the permanent displays which take up the entire second floor of the museum. Here is where visitors can get a broad overview of Taiwan’s history from geological formation to the present. The engaging displays take the visitor from prehistoric beginnings and give an overview of aboriginal culture, European exploration, Chinese migration, Qing Dynasty development, the Japanese era, and the post-World War II years up to the present. If the museum’s aim was to be crowd-pleasing, they definitely hit the mark here. There are countless interactive models, as well as video, multimedia, and wax model displays. They particularly went nuts with the dioramas, recreating an entire life-sized religious parade, a dockyard, and a full-scale Japanese era street complete with a moody cafe that you can enter. Much of the exhibition is one giant photo-op if your camera can handle the darkness (no flash or tripods allowed). Most of exhibition has good English translations and there is more than enough here to keep you busy for several hours and multiple visits. One of many life-sized dioramas. For those who find the broad overview of the permanent exhibition a little shallow and lacking in authentic artifacts, you’ll want to keep your eye out for interesting exhibitions from the museums vast collection. For information on current exhibitions click here. On the museum grounds, but not inside the exhibition hall, are a cafe and a restaurant. The restaurant, Tayouan, serves international food in a really nice atmosphere sitting right over Lotus Lake. Tayouan seems to be connected to Smokey Joe’s of Kaohsiung. The gift shop in the lobby is a pretty good place to pick up souvenirs. They have some great framed maps, handicraft, packaged foods, and various curiosities. The museum offers many services including Wi-fi, audio equipment, tour guides, wheel chairs, strollers, and onsite nursing facilities. Click here for a complete list of services and policies. There are many ways to get there that are well detailed by the museum. The No. 18 bus is a sure and direct way, but likely time-consuming. A train to Yongkang Station and taxi combination would likely be a better option. If you’re driving, probably the straightest route is just to head north on Ximen Road. Follow it about 7 or 8 kilometers through its name changes (XiaoBei, Zhongguan, Zhongzheng) until you get to Yong An Road (look for a Mitsubishi dealership on the right corner). Turn left onto Yong An and head up about a kilometer. You can’t miss it on the right. Get up close to the life-sized religious procession. Admission: Admission was free for the first year, and was still free on my last visit. I’ll update the fee when they decide to implement one. Hours: Tuesday to Sunday, 9:00 AM to 5:00 PM; Closed Mondays.